I'm not quite sure what has happened to time this week, but I seem to have lost a day somehow! 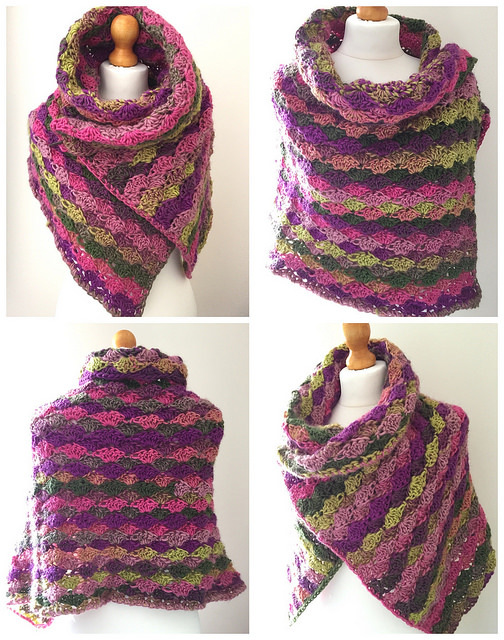 Last week I promised you the recipe for the super-simple Tulpen Crochet Shawl which was last week's Finished Object. 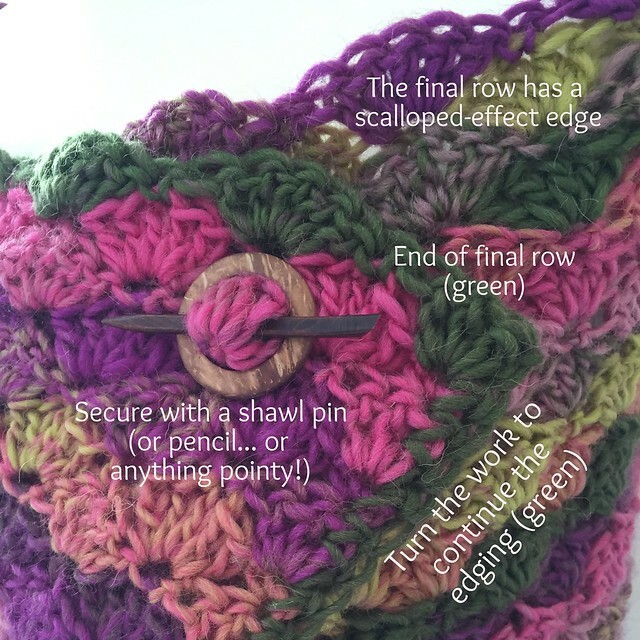 If you missed it, it's a basic (and very easy to crochet) rectangle, which can be styled in various ways with the use of a shawl pin. At Unravel I wore it folded in half as a thick collar/cowl and got lots of lovely comments about it. Repeat row 3 until the work is 45cm deep (I worked 34 rows) or until it's to your desired length. TIP: You will see that the dc is worked into the middle of the 5 tr on the previous row, and the 5 tr are worked into the dc from the previous row, so you won't need to count the stitches, simply remember to work the ch at the beginning of every row and it'll all work out. At the end of the final pattern row, simply turn the work 90 degrees to add the edging (pictured, below). The edging is simply 1 dc into each stitch along the bottom and into each space along the side of the rows (see pic). To turn the corners, work 3 dc into the same stitch. I hope you have fun with this. Do leave a comment or post a pic on the CftC Facebook page if you make it. I'm not normally a massive fan of wools that change colour for you, I usually end up with weird lumps of colour but this is just gorgeous! I think I may be converted!